Education is changing. Around the country and the world, students are no longer confined to traditional learning environments. They’re learning from anywhere, on any device, in ways that reimagine what’s possible. Teachers and researchers are innovating faster than ever. Advancements in pedagogy, evaluation, and student engagement are improving education daily. But challenges—old and new—threaten progress and jeopardize student success. In line with its commitment to help colleges and universities improve how students connect, engage, learn, and succeed, Cisco today announced a Blueprint for Digital Education at the Cisco Digital Education Summit at The Indian School of Business (ISB) Hyderabad. Commenting on the launch of the Blueprint for Digital Education at the Summit, Sudhir Nayar, Managing Director, Commercial Sales, Cisco India and SAARC, said, “Students today are hyper-connected technology users. They have high expectations that are constantly changing. As the world of education continues to change, educators must adapt to evolving expectations and benchmarks. By offering educators and students more ways to connect, engage, manage, and succeed, the Cisco Blueprint for Digital Education aims to help colleges and universities create a completely integrated digital environment that meets the high expectations of today’s students." With approximately 30 percent of India’s current population in the age group of 0 to 15 years, the education sector in India is poised to witness significant growth in the years to come and will play a key role in making sure of India’s growth in those years. However, India’s education system, which consists of more than 1.5 million schools, 750 universities, 35,500 colleges, and 260 million students, already faces challenges such as capacity, scale, and quality. They will be under considerable pressure to meet the requirements and expectations of next-generation students. 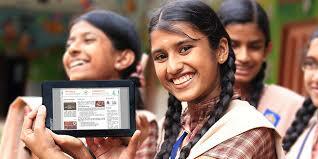 Now, more than ever, schools and universities in India understand the value of digital transformation in education. A common denominator among institutions that successfully implement digital technologies is active and progressive leadership. At the universities Cisco analyzed, the principals, deans, and chancellors—aided by strong, savvy IT leaders—who understand the transformational power of technology are pushing their institutions into the 21st century. In India, several leading institutions such as the Manipal University, Birla Institute of Technology & Science (BITS), Jamia Hamdard, and Narsee Monjee Institute of Management Studies are using Cisco digital education solutions to redefine the education experience.Cisco Launches Blueprint for Digital Education in India. · Enable students to learn anywhere: With Cisco Connected Classroom solutions, which use the Cisco Digital Network Architecture (Cisco DNA) and collaboration solutions such as WebEx online meetings and Cisco Spark all-in-one communications, students can learn how they learn best: anywhere, anytime, and on any device. Whether on or off campus or in a flipped classroom model, students and educators have highly secure access to educational resources, using their smartphones, tablets, and other connected devices. · Build an intelligent campus: By utilizing pervasive Wi-Fi access, sensors, and analytics, digital campus solutions enable higher levels of operational efficiency to campus administration and management, including smart lighting and connected vehicles, while allowing a deeper view into building efficiencies, student behavior, and network security. Cisco Connected Campus provides extensive network analytics that can help administrators make data-driven decisions while managing facilities, lighting, parking, and transportation. · Increase student and staff productivity: With smart workspaces that automatically track student attendance and progress, schools and universities can operate efficiently in a rapidly changing environment. · Foster global connections: Digital learning classrooms can support new online learning experiences, worldwide collaboration, and rich online media consumption with virtual classrooms. They empower students to learn on demand from any location, eliminating the boundaries that limit a student's ability to learn. · Support innovation, acceleration, and research: Cisco Connected Research solutions give researchers, faculty, and students the tools they need to connect and collaborate transparently on campus and around the world. They can conduct research—including high-performance computing (HPC)—in a secure environment and quickly scale computing resources to fuel innovation. · Create a safe and secure learning environment: Today's schools and universities can be the targets of both physical threats and cyberattacks. Cisco cybersecurity and physical security solutions help keep students, staff, and data safe and secure, whether on campus, off campus, or inside school vehicles.